Vortex &apos;s popular Crossfire rifle scopes have been redesigned to exceed performance standards in their price range! Longer eye relief, a fast-focus eyepiece, fully multi-coated lenses and improved, resettable MOA turrets ensure optimal performance in the field. The hard anodized one-piece aircraft-grade aluminum tube is nitrogen purged and o-ring sealed for a lifetime of waterproof and fogproof performance.&apos;s Diamondback scopes are loaded with features that put them in a class of their own! Single piece aircraft grade aluminum construction, full weatherproofing and fully multi-coated optics keep your scope functioning and your aim on target independent of what mother nature is doing. Get a Diamondback and get a scope for life. 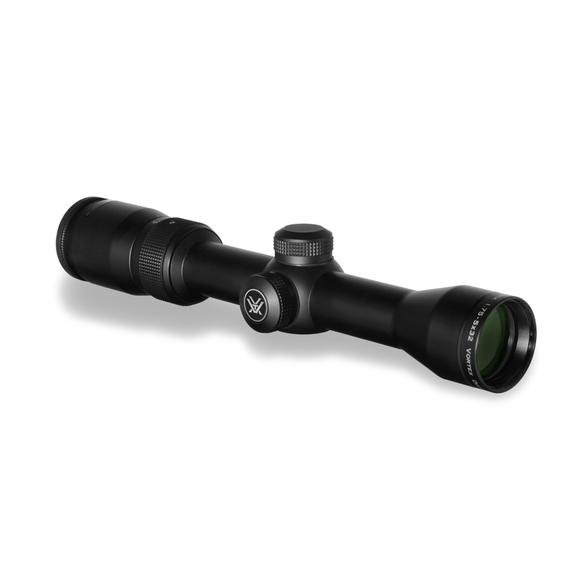 The 1.75-5x32 riflescope is ideal for big game, predator/varmint, muzzleloader, slug shotgun, and long range applications.